China: S Anhui, W Hubei, NW Hunan, Jiangxi, S Shaanxi, Sichuan. The entire population is estimated to number more than 53,000 individuals. The population comprises mostly young trees trees with very few seedlings or old trees. This variety occurs in coniferous, mixed and broad-leaved forests as an understorey shrub or a small to medium sized tree, and grows most often on limestone cliffs at lower elevations from 800 to 1700 metres above sea-level. This species yields high quality wood used in building houses, bridges (durability of the wood) and furniture; some of it is also used to make utensils, wood turning and for fuel. The seeds are edible and produce oil that is extracted; the essential 'torreya oil' is extracted from the aril. It is in cultivation in China, but not as widely as T. grandis; outside its native country it is only planted in a few botanic gardens and arboreta. This variety is highly prized as a timber tree, and it appears that the population is now comprised mostly of younger smaller trees in largely inaccessible areas. Hence the inference is that the population would have been more widespread and that much of the large mature population has been exploited in the past. It therefore seems reasonable to suspect a greater than 50% population reduction in the past three generations (150 years). General clearance of forest at lower elevations (especially for agriculture) would have had an impact. 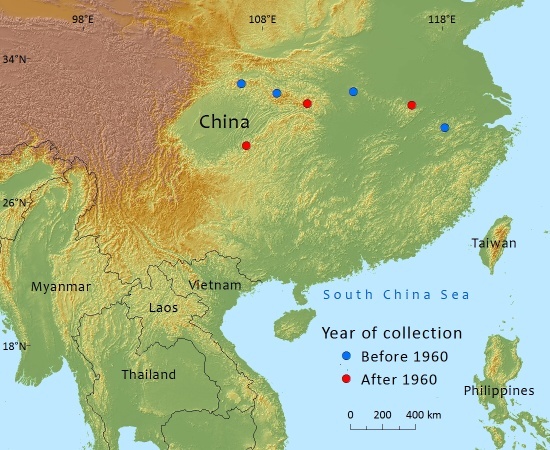 There has been considerable deforestation in many areas where it occurs (or has occurred in the recent past according to herbarium collections made since the beginning of the twentieth century). Larger trees were probably felled for their timber, and smaller trees used for firewood. There is a logging ban in place, but this may be hard to enforce. This variety presumably occurs in a number of protected areas across its range. C.Hilton-Taylor,Y.Yang,and D.Luscombe, 2015. Torreya fargesii var. fargesii, from the website, Threatened Conifers of The World (http://threatenedconifers.rbge.org.uk/taxa/details/995).